This matters since long-run trade impacts can dwarf the immediate economic benefit from cancellation of the UK’s financial contribution to the EU (of GBP 8.5bn in 2015 net of a sterling 5bn rebate and EU spending in the UK of sterling 4bn mostly to farmers and regions, such as Cornwall, where per-capita GDP is 75% or less of the EU average). Against this, the UK Treasury estimates that, after 15 years, the adverse impact of Brexit on annual fiscal receipts will be sterling 20bn if the UK participates in the EEA and double that if not, and notes the high-end estimate is equivalent to more than one-third of the budget for England’s national health service (NHS). 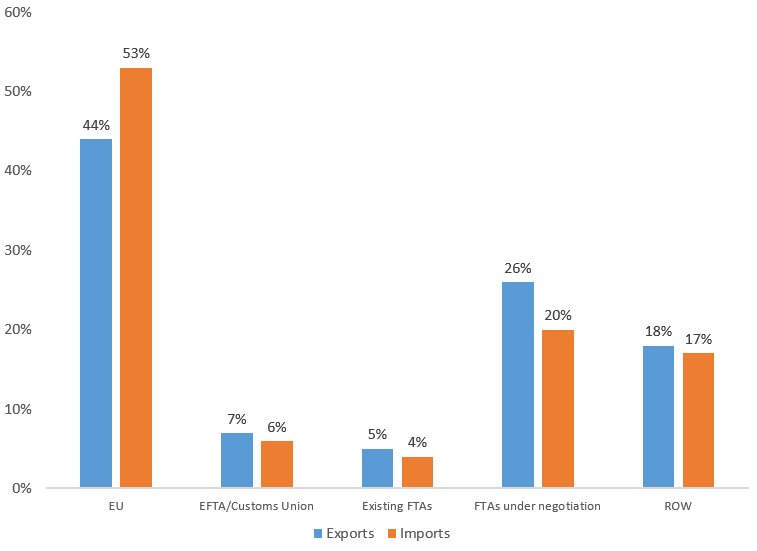 Trade represents 60% of UK national income and just under half of it is with the EU (Chart 1) and, by Treasury estimates, has been increased by ~three-quarters through EU membership. Furthermore, an additional ~30% of UK trade is through free trade agreements (FTAs), either existing or under negotiation, with third-party trading partners. Of the EU representing the UK in these FTAs and trade arrangements generally HM Treasury comments: “the EU has an economic weight 5 times that of the UK and so the EU’s counter-tariffs [allowed under World Trade Organization rules as a response to unfair trade practices from a partner] have greater impact giving the UK more bargaining power than when acting alone.” Against this, EU FTAs must be ratified by all EU-members making them cumbersome; the UK will be more nimble negotiating bilateral FTAs with trading partners such as the US and India. Access to the single market has been particularly important to the UK financial services business, contributing ~7% of GDP of which half is represented by exports, because of “passporting rights” allowing a financial firm to establish a European headquarters in one EU country and then offer services across all EU countries with no further licenses. The EU Commissioner of financial services, Jonathan Hill, resigned on Saturday does not express optimism that the UK will retain these passport rights: “most approaches that offer access come with free movement of people and I can’t see that flying given weight of immigration as an issue in the referendum debate”. We expect non-EEA financial services businesses, including banks and central clearing counterparties, to run their European businesses not from the UK but from EU countries with both Ireland and the Netherlands being considered. While there will be reorganization costs, we are buyers of Barclays which, after an 18% decline in share price on Friday, is now trading at less than half tangible book value (Chart 2). Given that, even under a worse-case, Treasury estimates the annual drag to GDP from Brexit over the next 15-years as 0.5%, this stock move is more about near-term stress in funding markets than long-run growth and returns. Indeed, measures of bank counterparty and dollar-funding risk moved adversely on Friday (so that the Euro basis, for example, reflecting demand for dollar over euro funding is now at 70bps for 3-month term versus 160bps in the financial crisis and 110bps in the Eurozone crisis) but these stresses will ease given Central Bank commitments to liquidity and the standing dollar swap liquidity lines between the Fed on the one hand and the ECB, BOE, and SNB on the other. 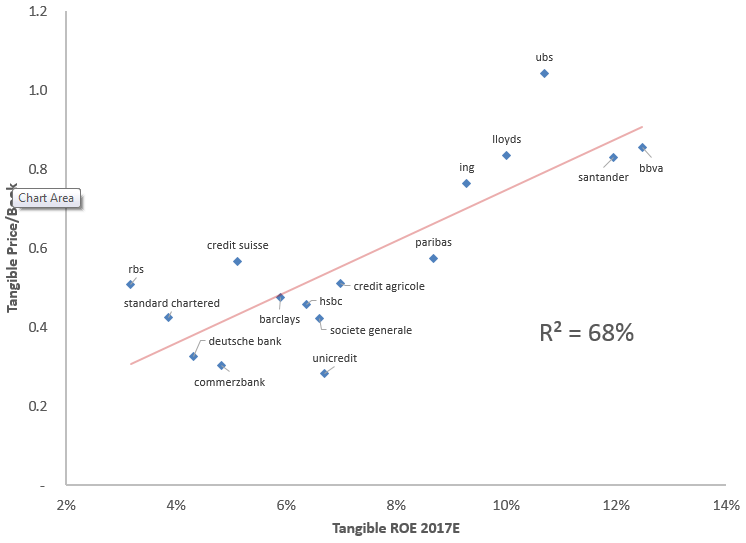 We continue to believe Barclays will succeed in generating a 10%+ tangible return on equity in its core business and that the consolidated return, of just under 4% in 2016Q1, will converge towards this as the drag from non-core operations, currently representing ~one-fifth of firm-wide tangible equity of ~GBP48bn, reduces over the next two years and is substantially eliminated in 2018. We expect this to lead to a valuation re-rating to at least 0.8x tangible book currently GBP2.86/share. The risk is of UK recession in the near-run but this should be averted given policy response, the shock-absorbing effect of sterling devaluation, and the 2-year window between the UK formally notifying the EU of its decision to leave under Article 50 and consummating the exit. Meantime, the Brexit process has breathed life into the FICC market and generated record FX volumes.